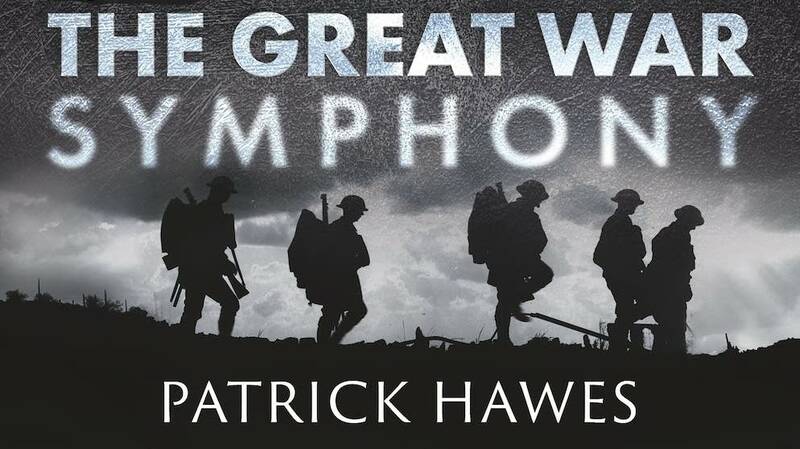 One hundred years ago, at 11 a.m. on Nov. 11, an armistice was signed, ending World War I. British composer Patrick Hawes composed The Great War Symphony as a musical memorial  for us and for future generations. "I don't want it to just be a symphonic work that is rewarding to listen to  of course I want it to be that  but I want it to be a work that speaks through music and words of that extraordinary sacrifice that was made." A dual American premiere took place in Minnesota and at Carnegie Hall in New York City on Nov. 11. And a recording of The Great War Symphony was made at Abbey Road Studios in London just in time to mark the centenary. Patrick Hawes conducts the Royal Philharmonic Orchestra and the National Youth Choir of Great Britain, and tenor Joshua Ellicott and soprano Louise Alder also play significant roles in this work. Hawes was first inspired to compose this work because of his maternal grandfather, who was in the First World War. "As a small child I spent a lot of time with him. I can remember that he'd lost a finger and he was also deaf in one ear. So, I was really knowledgeable of the First World War from an early age. The other thing was he used to sing World War I songs to myself and my brother, particularly 'It's a Long Way to Tipperary,' and 'Mademoiselle from Armentieres.' I can remember both those songs clearly, and, in deed, both of those melodies find their way into the symphony." Patrick says, each of the four movements of The Great War Symphony represents one year of the war. He dug into dozens of diaries, letters and poems to find just the right words to tell the story, and the title of each movement evolved from each of the texts. "These titles are: 'Praeludium,' which obviously speaks of an introduction, the beginning. Rather than the word 'prelude,' I liked 'praeludium' because it has greater gravitas. "'March' for the second movement, absolutely 'March.' I delay the use of the snare drum until the very beginning of the second movement, which is quite difficult for me because the snare drum is, of course, a great timbre associated with war. And throughout the second movement there's a greater sense of rhythmic urgency, a greater sense of forward movement, even in the slower sections. "The third year of the war was the year of the most terrible, terrible loss and devastation. So, for me, this was the perfect opportunity just to make things more still and to really reflect on the pain and the love. And that third movement, therefore, is an elegy. "And the fourth year of the war  the finale  which could have gone either way. I actually begin the fourth movement with the Dies Ire text from the Requiem because I think it speaks of deadlock and that kind of turning point between this world and the next and not really knowing what lies beyond. Though the movement does end with a great sense of optimism and ends with words by a wonderful American female poet Moina Michael, 'We shall keep the faith.' [It's a] fantastic poem  and a poem which speaks of the poppy being an emblem of the First World War for the very first time." There's also an incredibly gorgeous duet in that piece, "We shall keep the faith." Could you talk a little bit about the role that the tenor and the soprano play in this work? "To me it seemed perfect to have two soloists, with a male soloist representing the fighting man. As well as delaying the use of the snare drum to the second movement, I also delay the appearance of the soprano solo to the second movement. As a composer writing an hourlong work, you don't want to play all your cards at once. But, dramatically as well, the soprano soloist works perfectly from the second movement onward because she represents the woman back at home  the mother, the fiance, the wife, the daughter. "So, her first aria is in the second movement for the falling leaves where she speaks of everything in nature seeming somehow to foreshadow the pain that so many females particularly were going to feel as a result of the loss of so many young men. "There's a poem by Rupert Brooke towards the end of the symphony. Rupert Brooke says that those who died brought us  those who survive  as a gift, holiness. He says they gave us honor, and the other one is nobleness. Nobleness walks in our ways again. And we have come into our heritage." Listen: U.S. premiere of The Great War Symphony at Univ. of Minn.